Since its inception in the 1960s, the internet has made the world a better place by providing a unique platform for innovation, creativity, and economic opportunity. The internet has become a pervasive and fundamental part of our daily lives. Its impact on both economic development and solving problems in areas such as health, education, basic financial services, and agriculture is huge. Even after 20 years of availability of publicly usable internet, some 4 billion people – more than 55% of the world’s population – are devoid of its facility. Many do not have access because they live in hard-to-reach areas or do not have access to digital hardware and other basic infrastructure. Some do not see the benefits of being connected, often due to limited knowledge or understanding. Still others are illiterate or poor and cannot afford it. Iridium and Globalstar started building on their idea to provide wide cell phone coverage but promptly went bankrupt. Teledesic, a venture funded by Bill Gates, Paul Allen, and Saudi prince Al-Waleed bin Talal, got a lot of people interested but was scrapped before it launched its first constellation. Facebook started Internet.org in 2013 with the vision of Empowering rural communities via Internet. It acquired the Somerset-based company Ascenta in March 2014 for an estimated £12.5m to build Aquila. Google X launched Project Loon as a research and development project with the mission of providing Internet access to rural and remote areas. Microsoft is looking at starting a pilot project of its ‘White-Fi’ technology that uses the unused spectrum in frequencies used for broadcasting of television signals, and is likely to offer a solution to tackle the problem of last mile broadband connectivity in the country. Elon Musk, the founder of Tesla Motors and SpaceX, with Greg Wyler, former CEO of 03b are planning to place 4,000 satellites in Low Earth Orbit to make sure every part of the globe is wirelessly connected. Traditional players like Intelsat, the world’s largest satellite company by market capitalization, is using the capabilities of its next-generation geostationary satellites to deliver Internet connectivity to airplanes, cruise ships, the world’s merchant marine fleet. Aircel has just launched a plan called Free Basic Internet (FBI), which is providing low-speed Internet access for all, without charging anything. The speed of such access is capped at 64 KBPS, and the user can access the whole web without any discrimination. Smart, TNT, Sun offer free mobile Internet for all prepaid subscribers. The Govt. of India is developing BharatNet as part of the Digital India program, a revamped and larger version of the National Optical Fiber Network (NOFN) which plans on providing fiber optic connectivity to most of the 2.5 lac Gram Panchayats (moderate size villages). The projected cost of the project stands at $ 12 Billion. 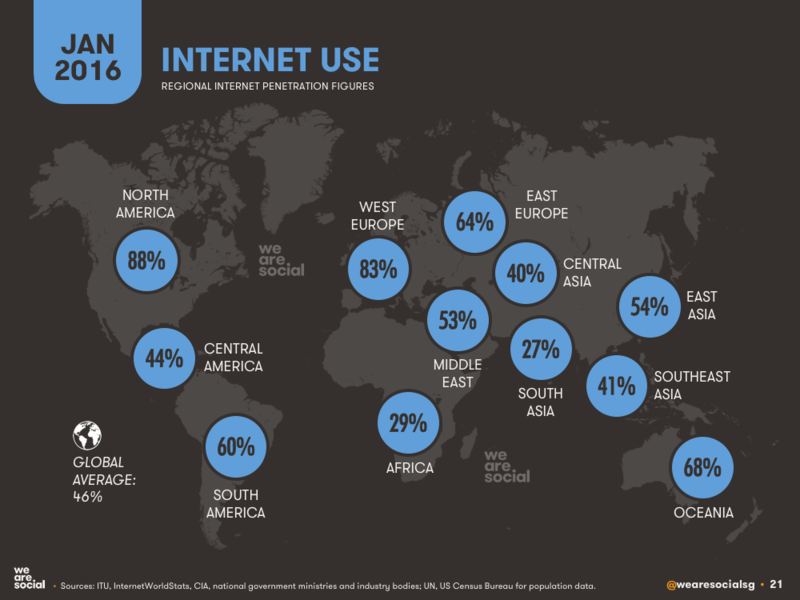 Why companies like Google and Facebook are interested in bringing more people to internet access? All the businesses and the services of these companies run on the internet, and without an end user’s asset who consumes all their services, sustainability is difficult. The success of their services is measured by the number of active users. Therefore, a strong ‘user-base’ is what matters the most to them and they spend millions each year to keep growing this list. The main motive behind providing affordable internet in remote or rural areas is to grow their user-base to areas having a rush of untapped users who are ready to consume a variety of services that require internet access. This will also help brand themselves among these new users as the ones bringing affordability and awareness of internet-based services to the masses. They will also be able to gain goodwill and promote themselves as a Socially Responsible company to the current set of users. Google undertook in-depth research and development with a mission of providing internet access in rural and remote areas globally. Google named it “Project Loon” as it uses high-altitude balloons which will travel approximately 12.5 miles above the Earth’s surface in the stratosphere. Each balloon functions like a mobile tower in the sky and connects with other floating balloons wirelessly to provide internet services down on earth. Project Loon was officially launched in June 2013. Google began a pilot experiment in New Zealand where about 30 balloons were launched in coordination with the Civil Aviation Authority from the Tekapo area in the South Island. In June 2014, Google tested its balloon-powered internet access in Brazil, making its first LTE experiments. In July 2015, Google signed an agreement with Sri Lankan officials to launch the technology on a mass scale. Google announced on its official blog that it will begin testing balloon-powered internet over Indonesia in 2016 aiming to provide connectivity to across 17000 islands. Google has signed a memorandum of understanding with Indosat, Telkomsel and XL Axiata of bringing two-thirds of Indonesia online which is still unconnected. The Loon project does not support Wi-Fi, hence, smartphones are not able to establish connections directly to the balloons. The users need to install a specialized antenna outside their home to receive and decrypt the signal. The Google balloons look to create a wireless network at 12.5 miles above ground level. In the stratosphere, there are many layers of wind and each layer of wind varies in direction and speed. Google asserts that a particular layer of the stratosphere is advantageous because of its relatively low wind speeds (e.g., wind speeds between 5 and 20 mph) and minimal turbulence as described by Google under their Patent application US20140319271 which discloses proper positioning of balloons using wind data. Given a reasonably accurate model of wind speeds within the 11–15.5 miles band, Google claims under their patent US 8733697 that it can control the latitudinal and longitudinal position of high-altitude balloons by adjusting only the balloon’s altitude that can be done by adjusting the volume and density of the gas (e.g., helium, hydrogen, or another lighter-than-air compound) in the balloon; the balloon’s variable buoyancy system is able to control the balloon’s altitude. Project Loon uses software algorithms to determine where its balloons need to go, then moves each one into a layer of wind blowing in the right direction. Technicians can maneuver these balloons and Air Traffic Control can keep a track of their location via GPS. A balloon powers itself by two renewable energies, sunlight, and wind. Its envelope is made from sheets of Mylar, a thin strong polyester film about 0.076 mm thick. The balloon can move up or down a 1 mile range through the bladder system. A balloon takes only 15 minutes to set up and broadcast data at speeds up to 10 Mbps. Each unit’s electronics are powered by an array of solar panels that sit between the envelope and the hardware. In full sun, these panels produce 100 Watts of power – enough to keep the unit running 24X7 while also charging a battery for use at night. A small box weighing 10 kg (22 lb.) containing the balloon’s electronic equipment hangs underneath the inflated envelope, like the basket that is carried by a hot air balloon. This box contains circuit boards that control the system and radio antennas to communicate with other balloons (mentioned by Google in its Patent application US 20140099122A1). Specialized radio antennas support two kinds of communications: balloon-to-balloon network and balloon-to-ground station or subscriber’s network. In July 2015, Facebook unveiled its solar-powered drone, “Aquila”, to deliver internet access to the masses particularly in remote areas of underdeveloped countries. This ambitious project is being supervised by Intetnet.Org that aims to provide affordable access to basic internet services to every person in the world. Aquila’s design is unique and is made of carbon-fiber that has a wingspan of Boeing 737, but weighs less than a car. It is designed by the aerospace team in the UK and named after the eagle in Greek mythology that carried Jupiter’s thunderbolts. These drone planes will be able to fly at an altitude of 60000 to 90,000 feet without landing for three months and will beam internet connectivity on the ground. The drones flown to create a network grid in the sky will synchronize and work exactly like mobile towers to carry and deliver data to the ground. However, Facebook will not be dealing directly with customers but will partner with local internet service providers of the country they want to offer their services in. Facebook has performed on-ground testing till now only with small model planes for up to 400 feet but expects to fly a real sized Aquila very soon. Facebook is believed to be ready with its full version Aquila drone that it expects to test flight at some location in U.S. by the end of this year. Aquila is based on cutting edge “laser” technology. The social network’s laser communications team based in Woodland Hills, California, developed laser technology capable of transmitting data at tens of gigabits per second. That’s 10x faster than any previous technique and can accurately connect with a point the size of a dime from more than 10 miles away. In theory, this new technology will enable Facebook to create a vast Internet network in the sky by transmitting data via laser from the ground to a drone, as well as from drone to drone. Lasers will be used for the drones to communicate with each other, while the drones will communicate with the ground using radio signals. A ground station will transmit a radio Internet signal to a mother aircraft that will then feed other aircraft in the constellation using laser technology, with the drones sending radio Internet signals down to users on the ground. As the planes are intended to stay afloat for three months at a time, the entire outside shell is covered in solar panels. This ensures a constant connection to the internet. During the day, when they are fully charged, the planes will fly at an altitude of 90,000 feet. But at night, in order to conserve power, they’ll float down to about 60,000 feet, going back up again the following day. Using a variety of data sources, facebook can figure out where people are located physically, in order to then decide the most cost-effective way to bring them connectivity. It is extremely difficult to draw a comparison between Google Loon and Facebook Aquila Drone as both of them are in their initial days and are prone to changes over the years before they perfect their designs. On the one hand, Google Loon project has already started providing its services in New Zealand and Sri Lanka, whereas Facebook Aquila Drone is still in development process. It is stipulated that Aquila will be able to take its first flight sometime before the end of this year. The main aim of both these projects is to make information available to as many people as possible. There are no strict timelines for any of these projects as both of these are still in their testing stages. We have however prepared a rough comparison on the basis of the specifications of both the technologies. Design/ Material The balloon consists of a Mylar envelope filled with Helium gas. Solar panels for power and antennas for beaming internet are also present. Aquila drone is a carbon fiber solar-powered UAV. Stage of Development Already functioning. Under development. These tech giants are investing heavily in their respective projects with an aim to provide connectivity to the unconnected parts of the world. However, they may also have to face both technical as well as regulatory hurdles in the countries they target to operate in. Both Facebook and Google have denied the idea of becoming service providers. When free Wi-Fi starts covering the globe in the coming years, traditional telecom service providers are bound to feel threatened as this could potentially wipe out the entire telecom industry. Something tells us the Telecom Industry is not going to let that happen so easily. Will ‘Internet for all’ be a reality and what reality would that be is still an answer troubling several academicians across the globe. Greetings! Really helpful guidance on this post! It is the small changes that make the biggest changes. Thanks a lot for sharing! Pretty confident he’ll have a good read. Thank you for sharing! Hi. Very helpful content. I always knew there is something wrong with the idea of ‘Internet for all’ and you showed me exactly what it was. Thanks. Thanks for this. You always have some amazing posts. I shared this on Facebook and my followers went crazy over it. Its good to see that so many companies and ventures are taking initiatives for providing internet facility to everyone. I feel that Google and Facebook are doing a great job by trying too hard in taking this initiative to a next level. “Internet for all” will have a long way to go and this facility will act as a silver lining for the people who are deprived of internet and technology in today’s world. Facebook is going to go farther than Google in this one. They were slow to start but are catching up pretty quickly. Very accurate information. I have read all your articles, one thing you guys are particularly good at is drawing a comparison and representing it photographically. Many thanks for sharing this information. I found your blog very useful and I want to thank you for that. I hope you keep doing this great job! Very well explained. Now I know why Google and Facebook are so desperate to give everyone internet access.